Tax professionals John Fredenberger and Delphine Brett-Ziller and Lucy Laederich, former president of the Association of American Residents Overseas (AARO), shared their expertise with the AAPA on a recent U.S. law that affects the financial affairs of Americans abroad and is making them rethink their US citizenship. They spoke to 25 AAPA members at an informal gathering with refreshments kindly hosted by AAPA doyen John Morris in his apartment on May 25. Originally aimed at cracking down on money laundering and tax evasion by Americans hiding financial assets abroad, the 2010 Foreign Account Tax Compliance Act obliges non-U.S. banks to report their American customers to the IRS or face a 30 percent fine. This, says Laederich, has had devastating consequences for the 8.7 million Americans living abroad whose “foreign” accounts are with the local banks they use every day. She pointed out the irony of the Internal Revenue Service closing its offices abroad – in London, Frankfurt, Paris and Bejing – just when Americans need their help the most. “Accidental Americans,” those born in the States who never lived there or those born abroad of an American parent, are among those most affected by Fatca. “Many of my clients say they don’t sleep at night,” said Brett-Ziller. For good reason: the majority of them has never filed a U.S. tax form and now face prohibitive fines. 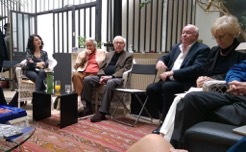 At the same time, the «accidental Americans” may be the only hope of changing the law, says John Fredenberger, who gave the example of a French “accidental American” who spoke about Fatca and the impact of Citizen Based Taxation before a group of parliamentarians at the French National Assembly – of which he is a member. “If foreign countries refuse to take this law sitting down and stand up on their hind legs, we may see progress,” said Fredenberger. The talk was both useful, for the many Americans in the room affected by the measures, and for reporters looking for a trend story.